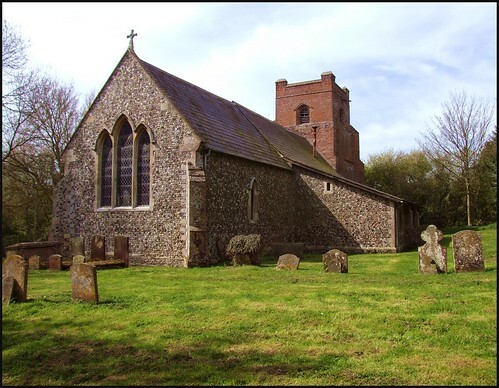 St Edmund is just about as remote as it is possible for a church to be in Suffolk. Hargrave Green, the village, is hardly a village at all, hidden in the lanes between Wickhambrook and Barrow. The lanes wind away from it for a mile or so, and finally vanish; if it were not for the signs, you would give up looking for the church. Instead, you turn down a muddy bridleway through the woods, which is just about wide enough to take a car, and thus stops this place from being as hard to access as nearby Depden, which is only reachable on foot. The lane runs between the Old Rectory and a farm, and then opens out into a narrow churchyard on the south side of St Edmund. Childrens voices from a nearby garden made it seem closer to civilisation, but not much can have changed here since the 16th century, when the red-brick tower replaced one that had fallen. The Victorians built a large aisle on the other side in the 1860s. There was once a south porch, but, in common with those at Akenham and Nettlestead, this church suffered when a German plane on the way back from a bombing raid on the Midlands unloaded its unused bombs over deepest Suffolk in 1940. The little porch was completely destroyed, and hasn't been replaced. I first came here about five years ago, and wandered around the outside exploring. I walked up into the more open east end of the graveyard to look back. I took longer than I normally would, simply because I thought there was very little chance of this building being open, being so remote, and so close to Bury, which is at the centre of a concentration of locked churches. On the simple south door I could see that there was no notice about a keyholder. But I tried the handle, and to my surprise it opened.Coming back in 2008, I was delighted to discover that the building was still open to pilgrims and strangers. I stepped into a square interior; the 19th century aisle opens out widely to the north beyond the arcade, and the chancel is boxed in by the remains of a screen, which we will come back to in a moment. A tortoise stove sits in the aisle. The air was damp and musty with the smell of age, which I thought very fitting. The windows were decorated with dried flowers and branches. It was all very atmospheric. A returning Victorian parishioner would immediately recognise the inside, except for a modern keyboard towards the west end. I assumed that this was now used to accompany singing; but there was another one towards the east, and I found two more in the aisle. How curious. Perhaps the churchwarden collects them. You step through the 15th century screen, and turn to look at the west side of this. In the top half, above the arches, are carved the most exquisite reliefs  there is a fox proudly carrying the goose he's caught, fish, dragons, a unicorn and a wyvern - and a peasant, probably a resident of Hargrave in the late middle ages. It is so unusual for there to be elaborate decoration on the eastern face of a screen, that you wonder if it has been replaced here wrongly, perhaps by the Victorians; but this doesn't seem to be the case. The rood beam also survives above. There is a delightful image niche set in a window splay in the south nave wall. I remembered being here on a beautiful September afternoon when the sun filled it with glorious light. Indeed, the whole church was full of a mellow, golden light that suited it, and me, immensely. It was the same coming back in late April: the interior of the church seemed to positively glow. The font is a good late-medieval one, with a pleasing cover. Virtually everything else wooden in the nave is also Victorian. In a church like this, it is always a pleasure to find that the furnishings are not over-polished, and the floors havent been carpeted. But the greatest pleasure is to be found up in the chancel. 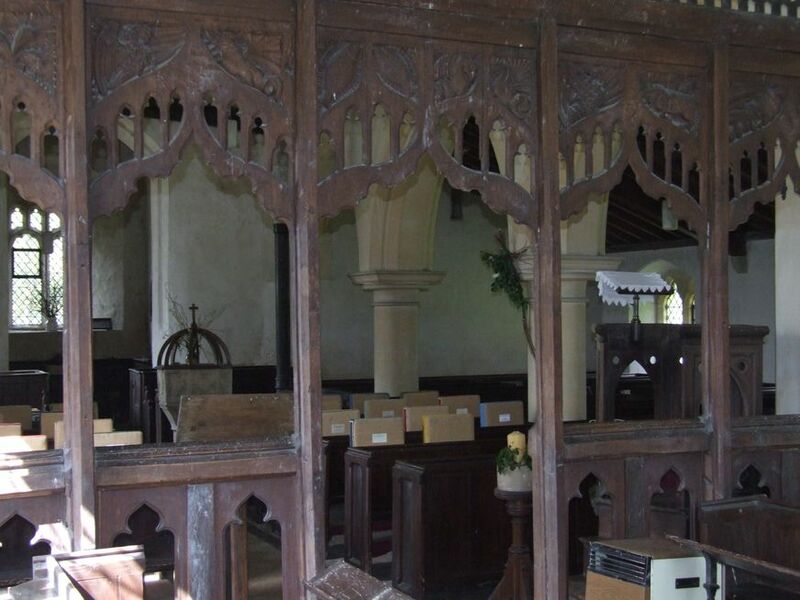 Apart from the screen, this isnt a church full of treasures  Cautley found the carvings crude, and the screen of little interest. This suggests to me that it was probably constructed and decorated locally, and this it makes it all the more interesting, I think. This church has a great air of continuity, of a simple building used by its parish as a centre of spiritual life, both Catholic and Protestant, over the centuries. I liked it very much for that.